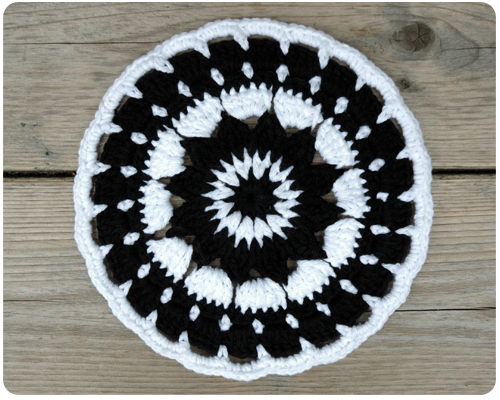 Most mandalas I have seen are very colorful, and while I have said that my favorite part of making these circles is deciding which color to use next , I decided to try something a little different with this mandala: using only black and white yarn and alternating these two colors. It is definitely striking, but I am undecided if I like it. What do you think? Are the multicolored mandalas more to your liking or is a two color version something you would try? I like it. I think it is very modern looking which is something I strive for with my knitting and crochet projects. It shows people knitting and crocheting aren't just for grannies anymore! I agree Vicky. Crochet (and knitting) are hip and modern! Thanks for reading. Ooh, I love it! The multi colored mandalas are pretty, but this one is just gorgeous. Very striking. Thanks so much for sharing your projects at the Say G'day Saturday linky party. I've pinned this-it's beautiful!